We have a wide range of occasional furniture to suit any home. Many items match our dining ranges and there’s a wide choice of styles. These are just a small selection of the items available. For the latest prices and offers please visit our stores in Burton on Trent or contact us via telephone or email. Bold & modern with enormous character, the Lyon range is simple yet stylish. Shown in oak with a glass top, other pieces are available, also in Walnut. Warm natural tones of American Oak, featuring soft grey colour accent detailing. Extensive range available. Taking inspiration from sophisticated indistrial styling through hints of both retro and Scandinavian design, Rockingham is a fashionable range that features an eclectic blend of shapes and forms. Tongue & groove effect tops, with clean lines and a low sheen finish add to the rustic charm for any town or country home. Many other pieces available in this range. 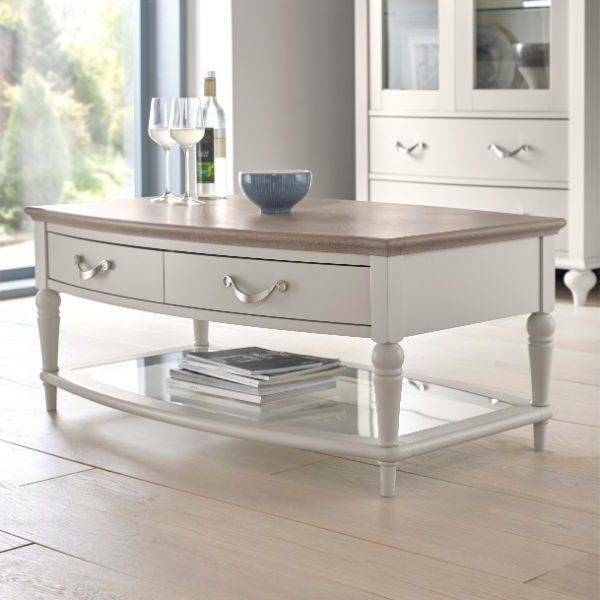 Beautifully designed Hampstead coffee table, to compliment the rest of the range, shown in Ivory and Oak, a timeless range bringing elegance to every home. Full range available. Grey washed oak and soft grey hues make for a perfect combination. Many more pieces to view in this range.